COLUMBIA, Mo. 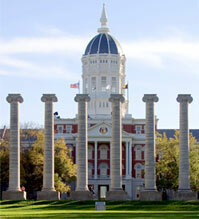 – The University of Missouri has been reaccredited by the Higher Learning Commission (HLC). The regional accreditation agency validates the overall quality of institutions and again has affirmed the mission and responsibility of Missouri’s flagship university to the public. As part of the accreditation process, a team of HLC peer reviewers visits the MU campus every 10 years. In preparation for the HLC evaluation and campus visit, the university assembled faculty, staff, administrators and students from across the university to form the Accreditation Task Force. Members were appointed in September 2013 in preparation for the February 2015 visit. Individuals from all areas of campus were represented on the task force; some of the represented areas include student affairs, academics, athletics, healthcare, institutional research and enrollment management. The institution’s resources, structures and processes are sufficient to fulfill its mission, improve the quality of its educational offerings, and respond to future challenges and opportunities. The institution plans for the future. Regional accreditation agencies are recognized by the U.S. Department of Education and accredit degree-granting post-secondary educational institutions. The HLC is one of six regional institutional accreditors and accredits in the 19-state North Central region of the United States. Accreditation is required for universities to receive federal funds for student financial aid and research. MU was previously granted a full 10-year reaccreditation in 2005. The university has been accredited by the HLC since 1913.